Over 100 figures in culture and entertainment sector, including prominent film director Park Chan-wook, had been unlawfully censored or penalized for publicly denouncing irregularities related to 2014 sinking of the Sewol ferry. In a report issued on Friday, the government-civilian joint committee to investigate Park Geun-hye administration’s blacklist of cultural figures found that 116 of 1,302 artists and entertainers who publicly decried the Sewol tragedy were either excluded from state support or had their work screened by the authorities. 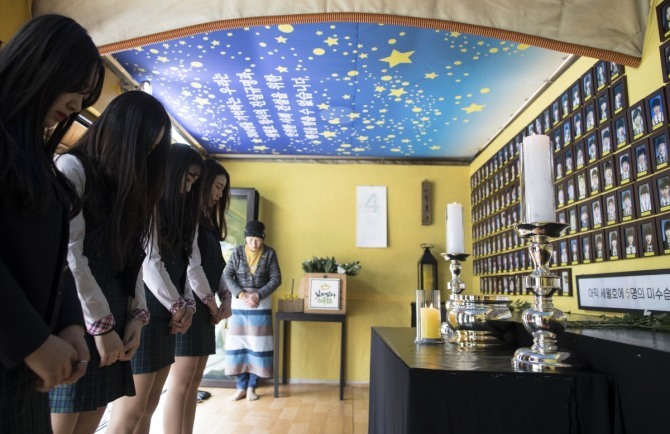 This included state officials sabotaging the play “This Child,” on grounds that its content -- which includes a scene where a child dies in a field trip -- could remind the viewers of Sewol. On April 16, 2014, the Sewol sank off the coast of Jindo, South Jeolla Province, leaving 304 dead or missing. Monday is the four year anniversary of Sewol tragedy. Government officials who had worked in print department of the Culture Ministry during Park administration told the committee that any writer who signed petitions related to Sewol was to be banned. Park, along with another popular director Hong Joon-ho, were among a group of directors who participated in a hunger strike for a special bill on investigation of Sewol tragedy and compensation for the bereaved families. Busan International Film Festival also had its regular government subsidy halved after premiering the documentary film “Diving Bell.” The film follows a controversy surrounding the rescue operation, specifically about the use of a diving bell during the rescue efforts. The report specified evidence of paranoia that the Park administration had at the time, believing that an organized resistance against it was being carried out. In light of the public furor against Park, former Chief of Staff Kim Ki-choon resorted to a hardline approach of defining public criticism of Sewol incident as an anti-government movement. On September of 2014, Kim gave orders that “Diving Bell” was not to be screened, with his aides reporting later in the month that they have procured 70 percent of the seats for the movie. Legal action against the officials of BIFF, cutting subsidies for theaters that screened the film and its distributor, had also taken place. As a testament to how much things has changed, another documentary film on Sewol hit theaters nationwide last week. Just three days after opening, the low-budget film became fastest politically themed documentary to surpass the 100,000 ticket mark on Saturday. Actor Jung Woo-sung provided the narration for the feature pro bono.